At home in a San Francisco Victorian or a Tuscan villa, this Classic range hood is shown in our custom Antique Bronze finish. Brass is chemically aged for an oil rubbed Bronze look and sealed with a protective top coat for easy care. 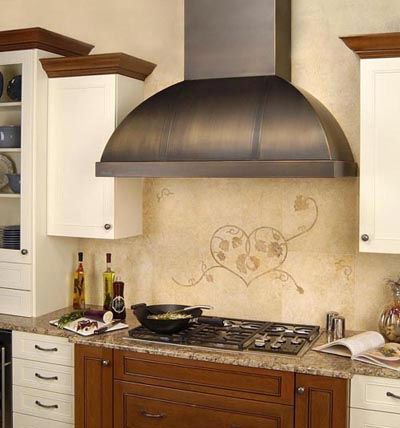 The juxtaposed bottom apron is eliminated, extending the range hoods gentle curve. Inspired by the turn-of-the-century black iron hoods used over wood burning stoves, the general rounded shaped is retained, while refining the crude fabrication techniques of days past. Beveled bands in contrasting materials of finish accent design.